To Cite: Tahmasebi M N, Mirkarimi S S, Sharafatvaziri A, Miresmaeili H. Knee Hydatidosis: A Case Report, J Orthop Spine Trauma. 2018 ; 4(1):e85717. doi: 10.5812/jost.85717. Introduction: Primary bone hydatidosis is a rare disease. The clinical manifestations of bone hydatidosis are confusing. Musculoskeletal involvement in hydatid cyst may be misdiagnosed as bone tumor. Although bone hydatidosis is not very common, timely diagnosis and treatment of this disease is important for preventing serious complications. Case Presentation: This study reports on a 37-year-old woman with primary bone hydatidosis of distal femur and secondary involvement of the knee joint. The patient was treated with arthroscopic irrigation and debridement and open curettage of bone lesion. The bone defect was filled with bone cement. Oral albendazole was prescribed for six months. Twenty-two months of follow up showed no sign of recurrence. Conclusions: Its recommended that hydatid cyst should be considered a differential diagnosis of any lytic bone lesion in the endemic region. It could be suggested that curettage and filling of the defect with bone cement is a safe and effective surgical treatment. Hydatid cyst or hydatidosis is a parasitic infection caused by Echinococcus granulosus. This disease is endemic in North Africa and the Middle East, Turkey, India, South America, and Southern Europe. The most common organs involved in this disease are the liver (55% to 75%) and Kidneys (18% to 35%). However, hydatid cyst can appear in any organ of the body (1). Rarely the bone is initially involved (1% to 2.5%). The most common sites of bone involvement are the spine and pelvis and long bones are rarely involved (2). Primary bone hydatidosis occurs when scolexes pass through the circulatory system inside the bone. In bone hydatidosis, due to the hardness of bone tissue, a daughter vesicle is formed rather than a single cyst. Parasites slowly spread in the medullary canal, causing destruction of the bone trabeculae. Bone involvement in hydatidosis can cause pain, yet the patient sometimes remains painless for a long time. Pathologic fracture is rarely the first manifestation of the disease (3). In addition, musculoskeletal system involvement in hydatid cyst may be misdiagnosed as bone tumors in radiological studies. A 37-year-old woman with the complaint of painful and swollen right knee was admitted to the orthopedic clinic of the current authors. In the clinical examination, there was diffuse swelling of the right knee and tenderness in the medial condyle of the femur. The range of motion of the knee was normal. Serological tests, including complete blood count (CBC), erythrocyte sedimentation rate (ESR), C-reactive protein (CRP), and indirect hemagglutination test (IHA) were normal. After taking plain X-ray (Figure 1), the patient was subjected to knee computed tomography (CT) (Figure 2). 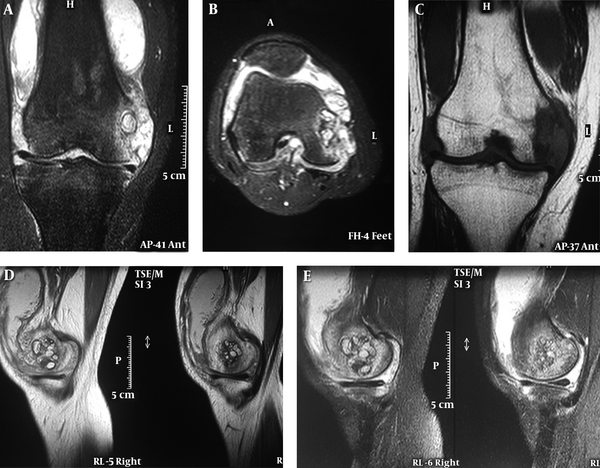 A lytic lesion was observed with cortical erosion in the medial condyle of the right knee in magnetic resonance imaging (MRI), a large signal intensity lesion was seen in medial condyle of femur with multiple cysts (Figure 3). In T2-weighted scans, synovial hypertrophy and low intensity lesion were observed in medial gutter and intercondylar notch regions. In the early review of MRI images, performed by an experienced radiologist, pigmented villonodular synovitis (pvns) was reported. The patient, with a possible diagnosis of pvns, was subjected to arthroscopy of the knee. In arthroscopy, many suspended particles appeared as vesicle in the knee. Diffuse synovial hepertrophy of the knee was evident, especially in the medial gutter and intercondylar notch. Arthroscopic debridement and synovectomy were performed. Subsequently, open biopsy and curettage were performed through the medial subvastus approach. Histopathological examination was consistent with the hydatid cyst. Radiological examination by CT and ultrasound showed no evidence of involvement in other organs. Oral albendazole (10 mg/kg/day) was prescribed for three months prior to definitive surgery. Through prior incision, curettage of the bony lesion was performed. The bone defect was then filled with bone cement and cortical screw (Figure 4). Subsequently, oral albendazole was administered for six months. The patient was followed up for 22 months after surgery, and no recurrence was observed. The patient’s functional outcome was good and she was able to perform daily activities without restriction. Bone involvement is rare in hydatid cysts (1% to 2.5%). The most common sites of bone involvement are spine (35% to 50%), pelvic tibia, femur, and humerus, skull, and ribs, respectively (1, 3). Skeletal involvement in hydatid cyst often occurs secondary to a diffuse disease of the hydatid cysts of the liver or lungs. However, occasional primary bone involvement occurs without evidence of systemic disease (4). In the reported patient, distal femoral involvement initially existed and there was no evidence of systemic illness. To the best of the author’s knowledge, knee joint involvement is secondary to distal femoral lesion or proximal tibia (5, 6). In the reported patient, secondary knee joint involvement had caused the destruction of the distal femoral medial cortex and the direct diffusion of hydatid cyst to the knee joint. Bone hydatidosis often has a slow clinical course and may be asymptomatic for many years. Imaging findings are often non-specific and confusing. Radiography often represents a simple or multiple lesion, sometimes accompanied by thinning and degeneration of the cortex. Radiological manifestations of bone hydatidosis sometimes resembles bone malignancy (7). In the current patient, there was also an eccentric lesion with cortical erosion in the medial femoral condyle. Magnetic resonance imaging is helpful, yet not specific in detecting bone hydatidosis (2, 4). The MRI images in the patient, although examined by an experienced musculoskeletal radiologist, were reported with pvns. Considering radiographic manifestations of hydatid cyst on the knee, knee hydatidosis can be considered as a differential diagnosis of knee pvns in endemic areas. In general, serological tests to detect hydatid cyst disease have low sensitivity and specificity (2, 8). In the reported patient, IHA was also negative. Eosinophilia is found in CBC of 25% to 30% of cases of hydatid cysts, (7). CBC in the current patient was normal. Due to the lack of specificity of clinical symptoms and paraclinical findings, it is difficult to diagnose hydatid cyst before surgery. Therefore, a definitive diagnosis is possible only by a precise pathologic examination. Anthelmintic drugs alone are not effective in eradicating hydatid cysts, and the only effective treatment of bone hydatidosis is complete resection of the lesion with surgery (4, 7, 9). It has been reported that lesion curettage without removing the wide margin combined with anthelmintic drugs is also effective in the treatment of bone hydatidosis in long bones (7, 9-11). Filling the bone defect with bone cement can help with the elimination of daughter cyst and relapse prevention by creating thermal necrosis (12). Some authors have also suggested that surgery should be performed by wide margin to prevent recurrence (13). In the current patient, due to the proximity of bone lesion and the knee joint, radical surgery was impossible and the final surgery was carried out through lesion curettage and filling the bone defect with bone cement. There was no evidence of recurrence 22 months after the surgery. Despite all the therapeutic measures, the recurrence rate of bone hydatidosis has been reported to be 17% (14). Even one case of local recurrence of bone hydatidosis was reported after 10 years. One of the variables that is associated with local recurrence is the involvement of a distant organ. It has been reported that the simultaneous involvement of another visceral organ increases the risk of a recurrence or progression of the disease up to five times (14). Therefore, a long follow-up is needed to judge the effectiveness of various types of bone hydatidosis therapy. Diagnosis of primary bone hydatidosis is often difficult and requires high clinical suspicion. Therefore, it is recommended that hydatid cyst should be considered in differential diagnosis for assessment of bone lytic lesions in endemic area. 1. Sachar S, Goyal S, Goyal S, Sangwan S. Uncommon locations and presentations of hydatid cyst. Ann Med Health Sci Res. 2014;4(3):447-52. doi: 10.4103/2141-9248.133476. [PubMed: 24971224]. [PubMed Central: PMC4071749]. 2. Song XH, Ding LW, Wen H. Bone hydatid disease. Postgrad Med J. 2007;83(982):536-42. doi: 10.1136/pgmj.2007.057166. 3. Morris BS, Madiwale CV, Garg A, Chavhan GB. Hydatid disease of bone: A mimic of other skeletal pathologies. Australas Radiol. 2002;46(4):431-4. [PubMed: 12452919]. 4. Siteti MC, Injete SD. Update on human bone hydatid disease. Sci J Clin Med. 2015;4(1):10-7. doi: 10.11648/j.sjcm.20150401.13. 5. Mohsine A, Abdelaziz A, Imane EB. Hydatid cyst of the thigh revealed by acute knee arthritis: Report of a case. Scholars J Med Case Rep. 2016;4(6):456-8. doi: 10.21276/sjmcr.2016.4.6.29. 6. 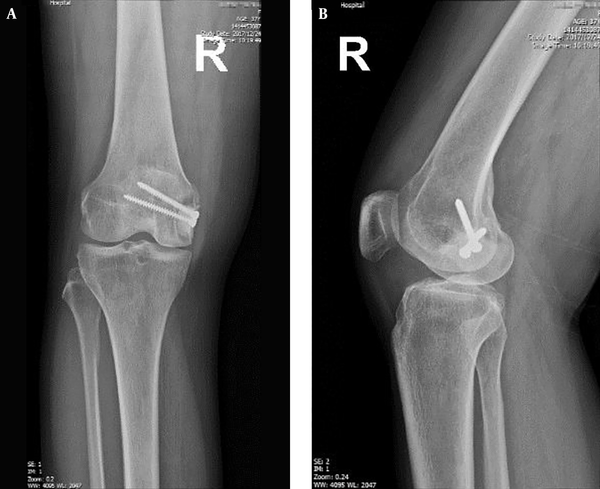 Sevimli R, Korkmaz MF, Akpolat N. Hydatid cyst located in knee joint and tibia: Case report. Gavin J Case Rep. 2016;2016:13-5. 7. Gnanasekaran KK, Prabhu AJ, George S. Osseous hydatidosis of femur in a patient with fracture non-union: An uncommon entity. J Clin Diagn Res. 2016;10(12):ED06-8. doi: 10.7860/JCDR/2016/23610.9097. [PubMed: 28208867]. [PubMed Central: PMC5296440]. 8. Manzano-Roman R, Sanchez-Ovejero C, Hernandez-Gonzalez A, Casulli A, Siles-Lucas M. Serological diagnosis and follow-up of human cystic echinococcosis: A new hope for the future? Biomed Res Int. 2015;2015:428205. doi: 10.1155/2015/428205. [PubMed: 26504805]. [PubMed Central: PMC4609352]. 9. Kalinova K, Proichev V, Stefanova P, Tokmakova K, Poriazova E. Hydatid bone disease: A case report and review of the literature. J Orthop Surg (Hong Kong). 2005;13(3):323-5. doi: 10.1177/230949900501300321. [PubMed: 16365502]. 10. Kassa B, Yeshi M, Abraha A, Gebremariam T. Tibial hydatidosis: A case report. BMC Res Note. 2014;7(1):631. doi: 10.1186/1756-0500-7-631. 11. Kuyucu E, Erdil M, Dulgeroglu A, Kocyigit F, Bora A. 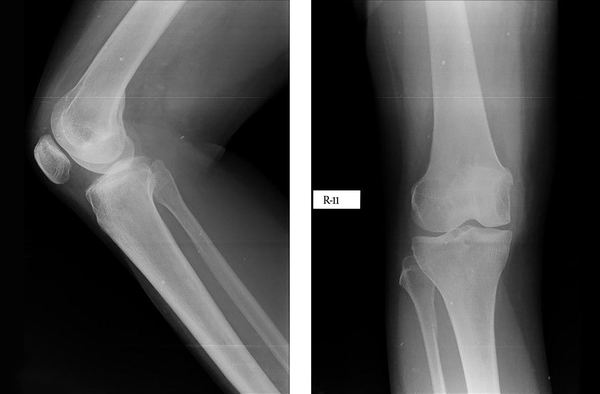 An unusual cause of knee pain in a young patient; hydatid disease of femur. Int J Surg Case Rep. 2012;3(9):403-6. doi: 10.1016/j.ijscr.2012.05.003. [PubMed: 22694798]. [PubMed Central: PMC3397297]. 12. Yildiz Y, Bayrakci K, Altay M, Saglik Y. The use of polymethylmethacrylate in the management of hydatid disease of bone. J Bone Joint Surg Br. 2001;83(7):1005-8. [PubMed: 11603512]. 13. Erol B, Onay T, Caliskan E, Okay E. Oncological approach with antihelminthic chemotherapy and wide resection in the treatment of musculoskeletal hydatidosis. A review of 10 cases with mean follow-up of 64 months. Acta Orthop Belg. 2015;81(3):530-7. [PubMed: 26435250]. 14. Samadian M, Alavi E, Sharifi G, Rezaee O, Faramarzi F. Extension of echinococcal spinal infestation extra- and intradurally after a decade of extinction. J Neurosurg Sci. 2010;54(4):143-8. [PubMed: 21423084].